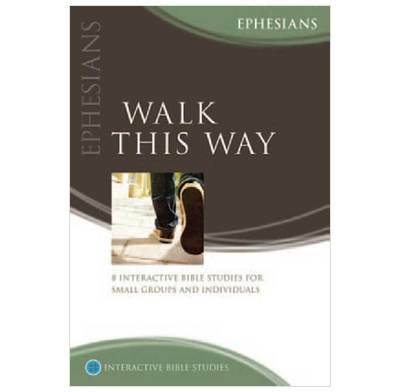 Learn about God's purposes for us, what he has done for us, and how we are to walk on to Heaven. If the Christian life is a journey, where are we going to? How did we get started? How should we be travelling, and do we have any reason to believe that we will make it to the destination? In Paul's majestic letter to the Ephesians, the whole of our Christian journey is on view - from the secret and wonderful purposes of God before all creation, to the final consummation when everything is summed up in Christ, and all points in between. In this insightful and challenging set of studies by Bryson Smith, we learn about God's gracious purposes for us, what he has done for us in Christ, and how we are to walk on the royal road to Heaven, pursuing the good works that he has prepared for us to do, and fighting the battles that inevitably confront us. 1. You've got it all! We're only half way through, but so far this is a great series of studies - quick to get into and to begin to open up the profound text of Ephesians. The "think it through" questions have been the least helpful, but that might be because we have already dealt with the application as we were going through the "investigate" sections. A really useful study guide, particularly as I'm still quite a new Christian. Provoked a great deal of lively discussion in my study group. So much so that we still haven't finished the book. Discussions have gone on so long we've had to complete some of the studies in two sessions! Our group has found that this study, like most Methias Media studies ,is well organised, clear and informative. The questions are well thought-out and lead the reader step by step to a deeper understanding of the text. I like the way it sometimes refers the student to other parts of Paul's writings to clarify or expand his meaning. Fantastic. I used this as a basis and inspiration for some studies I did recently, and it was invaluable. Only note: quite a few of the studies are probably a bit long for an hour, unless discussion in your group is like squeezing blood from a stone. You may want to allocate more than eight weeks to get through it. My own background: I have led small group Bible Studies for many years, including choosing the Scripture passage to be studied and study material. I have used study materials from a wide variety of sources, and where there was no suitable printed material for the passage in question, I have created materials. My main purpose in using ‘printed materials’ was that those leading studies at least had a basis I never insisted that they slavishly follow printed materials. I say this since, in years of experience, I cannot remember finding printed material which I could follow more than about 70%/. In fact for me, most printed materials have only been used to set the passage of Scripture. ‘Walk this Way’ has brought about two ‘firsts’ for me, namely this review and, amazingly, this is the first printed study book which I have used from cover to cover! Having read through the questions set and the comments made in the book, I decided that as a change every we would follow the book 100%, with each person having a book, and everyone trying out the questions before the study. 1) Some ‘Think it through’ questions were better suited for individuals than small groups eg Q3, p16; Q2, p21; Q5, p22; Q3, p31. Please do not let the ‘Points for possible improvement’ cloud the excellence of this particular study.